These 12 recipes using ricotta cheese will fill the bill if you have some extra ricotta cheese after making Ricotta & Orange Pancakes. 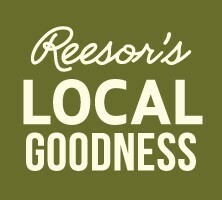 Check out Reesor’s Pinterest Cheese & Dairy board and our other boards on Pinterest. You’ll find our own recipes and other inspiring recipes from around the web. We hope you’ll like what’s interesting & exciting to us about food, life & the land. We make our turkey meatballs using ground turkey from Round the Bend Farm in Kettleby, Ont. They are already cooked for you to heat and serve at home. They’re made with celery, onions, parmesan cheese, milk, eggs, canola oil and other seasonings. Made with Jennifer’s Original GF bread they are gluten free. We also offer frozen ground turkey and turkey sausages from Round the Bend Farm. The kitchen team at Reesor’s is often thinking of different ways of enjoying the foods we make. And if you know some of Jay’s extended Reesor family you may know that we love to talk about and analyze food. Joyce, who is Jay’s first cousin and is pictured above holding the salad bowl, and his sister Susan put their minds to our turkey meatballs and suggest these six variations. Heat them in the microwave and add to Reesor’s Vegetable Barley Soup. Make a meatball sandwich: Heat the meatballs, slicing them in half and laying them on your choice of bread or bun. Add sliced provolone cheese, tomato sauce, sautéed mushrooms or sautéed spinach. Make a wrap: Heat the meatballs, slice them in half, put them in a tortilla, add salsa, shredded carrots, fresh cilantro, and mozzarella cheese. Heat the meatballs and serve them on a bed of couscous mixed with almonds, apricots and shredded carrots. Make a pizza with Reesor’s pizza dough. Add a layer of tomato sauce or pesto, adding meatballs and mozzarella cheese. Heat them in a tomato sauce; serve over pasta.